Are you surprised? That I don't have a Christmas book up today? I'm surprised. But it's STILL NOVEMBER, for one last day. 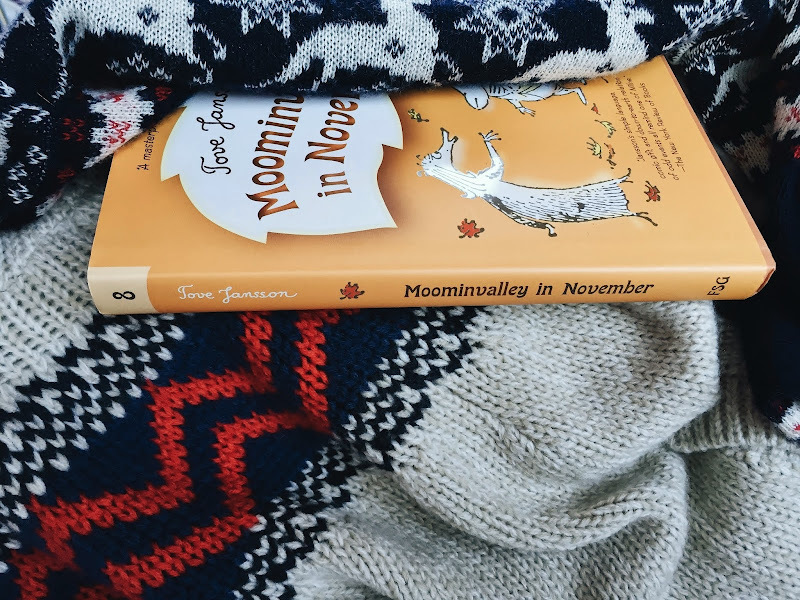 And I've mentioned 'Moominvalley in November' by Tove Jansson before, but it hasn't received its very own post before, and I was bound and determined to get it up actually IN November. So here it is. 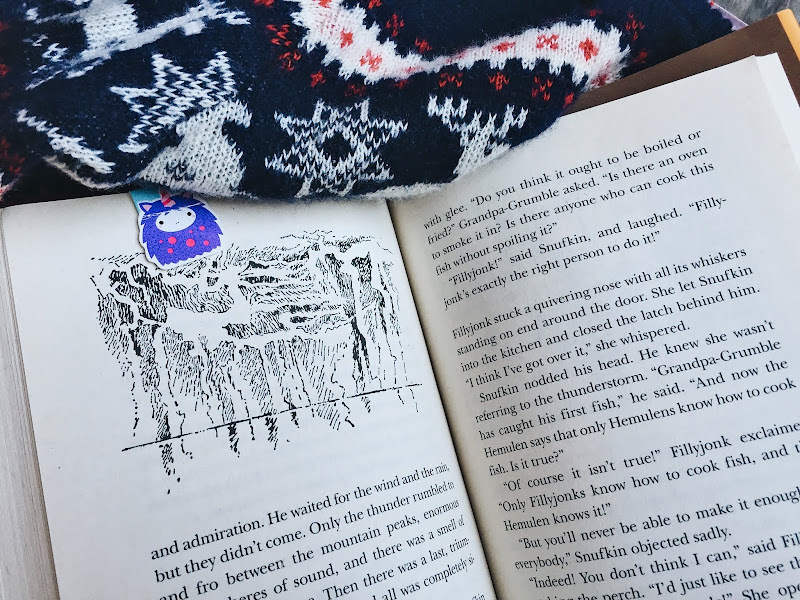 Let's talk about Moomins (again), before it's all Christmas, all the time. I've talked about the Moomins sooooo many times. (Look here for one of the more stunning Moomin books.) I sound like a record that's perpetually broken, but please please please please bring Moomintroll books into the lives of your children. I won't do the same song and dance again. That's boring. I'll just cover the highlights: Finland. Little troll creatures. Hilarious, philosophical, funny. Not for 5 year olds - Best for ages 7-10. (take a peek at the last photo up above and have a gander at the vocabulary used. That's why it's better for slightly older kids.) Like nothing you've ever read. 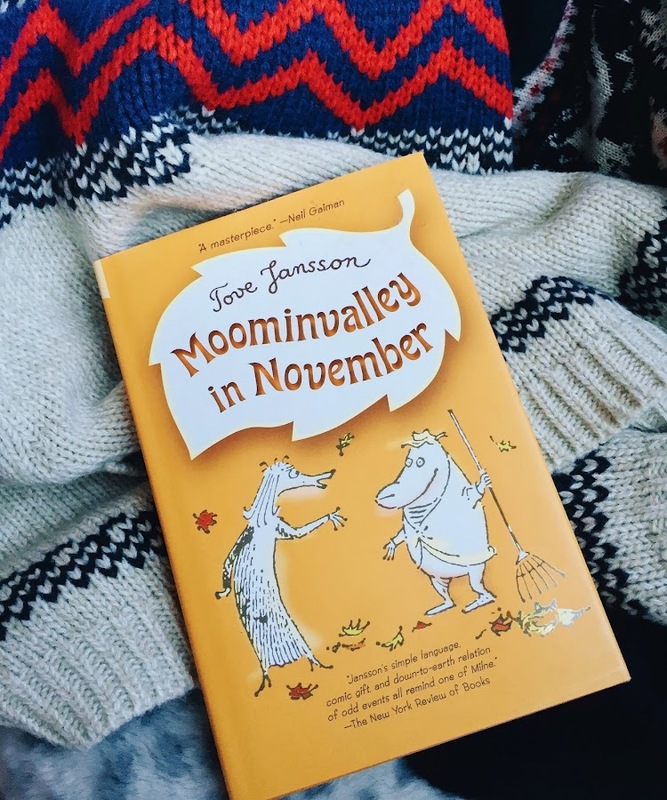 While most of the Moomin series is full of plot driven adventure, like escaping from floods, and comets, flying on clouds, and performing in theatrical troupes - 'Moominvalley in November' is more contemplative. Unlike the other books in the series, this one I don't find to to be the best read-aloud. 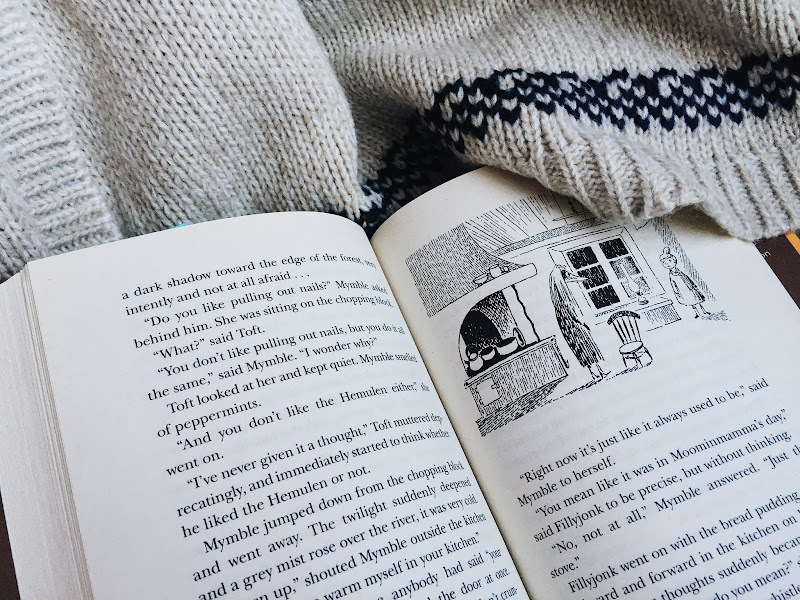 It's better just to read it quietly to oneself and fall under the spell of the creatures living in the Moomin family's house (the Moomin family is off on a trip, which of course means that other personages just scoot themselves on in to make themselves at home during the Moomintroll family's absence). The collection of odd characters have to get along during this strange house party. There's a creature who perpetually lives under/behind the stove. There is Moomintroll's BFF, Snufkin. There's Fillyjonk, who needs to relax, but never can. There's Grandpa Grumble. And Mymble. What's interesting about this book is the atmosphere. You can FEEL the melancholy of autumn, you can feel the unhappy feelings of some of the more peevish characters. There really isn't much plot. The housemates just bumble along and interact with each other....and I'm asking you to read this one, or give it to your kids? YES I AM. 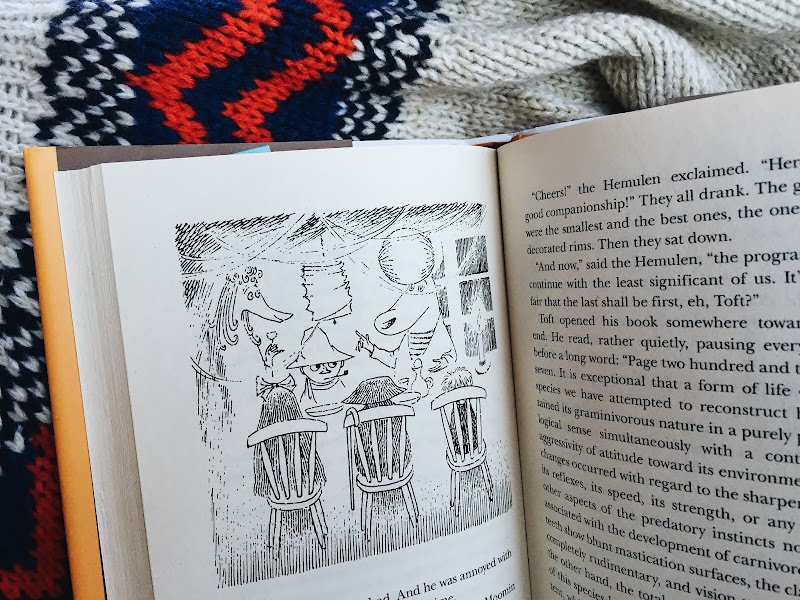 It has a totally different feel than the happy-go-lucky madcap sense of whimsy found in the other Moomin books, and that's what makes it so cool. The atmosphere is so strong in this, and its strange beauty fleshes out some of the background characters of the series, which is cool and fun. Moomins. Harry Potter. Narnia. Oz. Are you feeling me here? 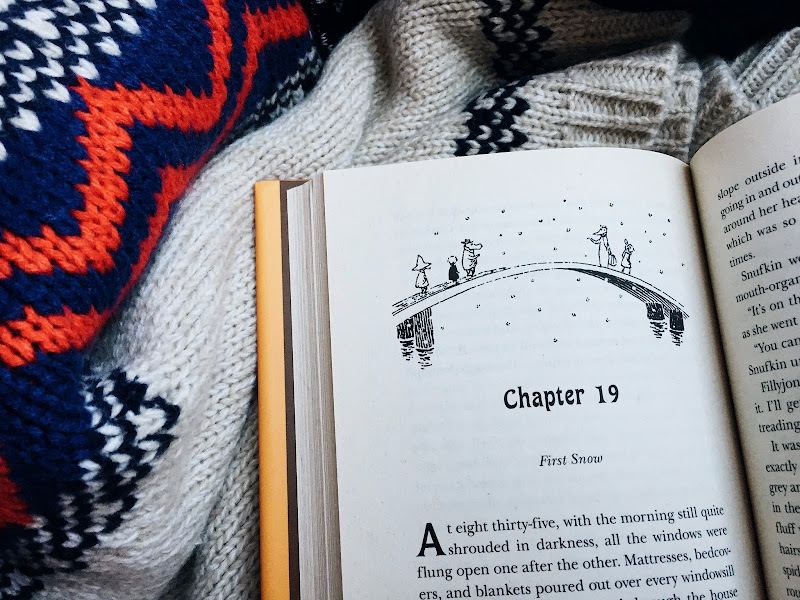 I place the Moomin series of books in with the best of the best classics. They're THAT good. Ugh, we need to read these. I'm so looking forward to after Christmas, when we're done with shows (for a long while!) and have evening time again.